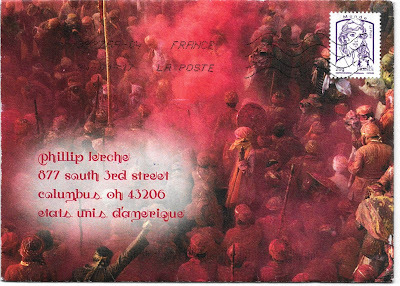 An envelope showing a scene from the Indian festival of Holi. 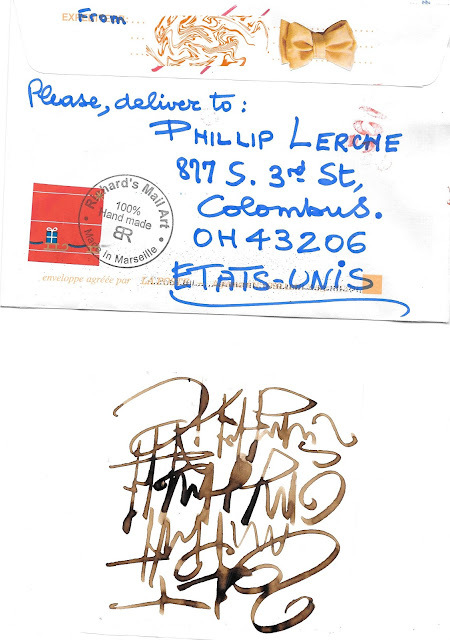 I'm loving the unusual font, too. 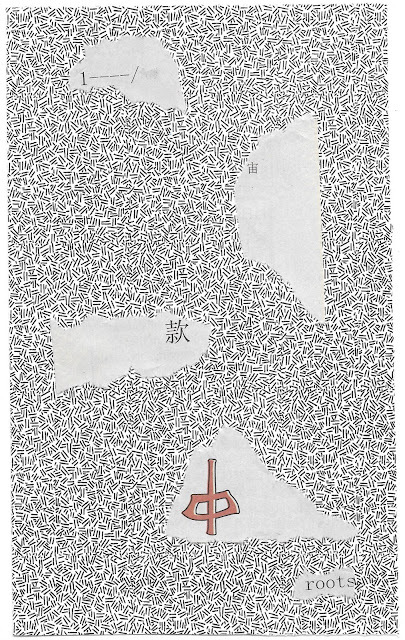 I always think of cold and ice when I think of north. Carina sent me a great little booklet in the form of a tiny letter which arrived in this envelope with a superb cold stamp. 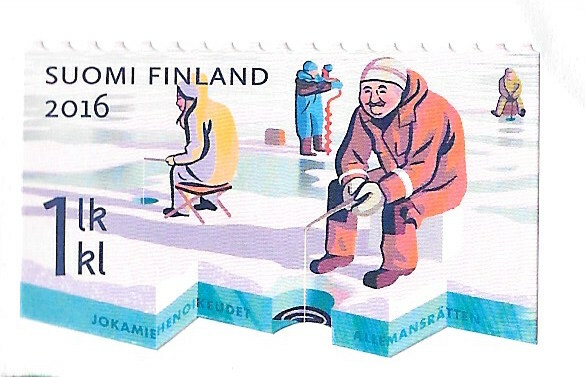 Ice fishing from Finland! 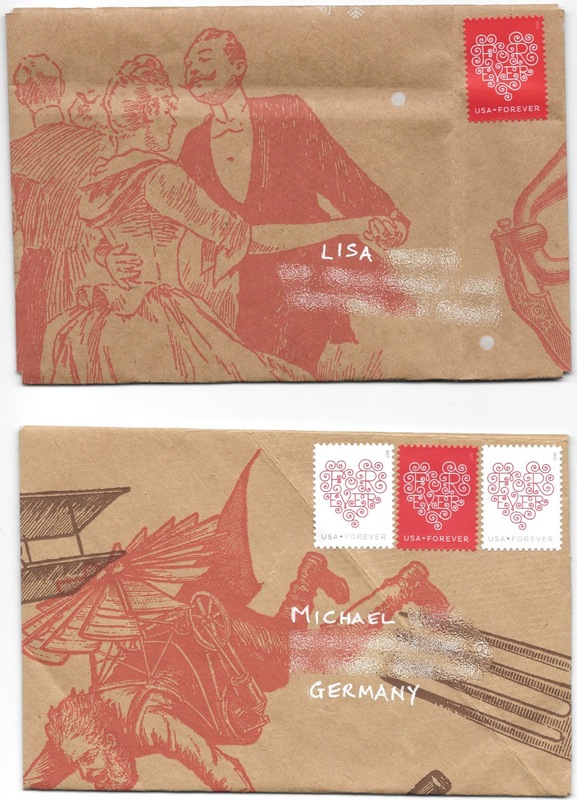 And of course, in true Posti style, the bottom half of the stamp has a special shape. 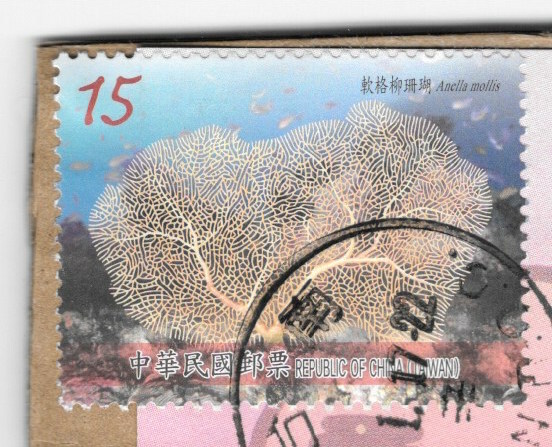 The stamp celebrates 'Everyman's Rights' to enjoy nature. It is from a set of 6 celebrating this theme in 2016, the 100th anniversary of Finland's independence. 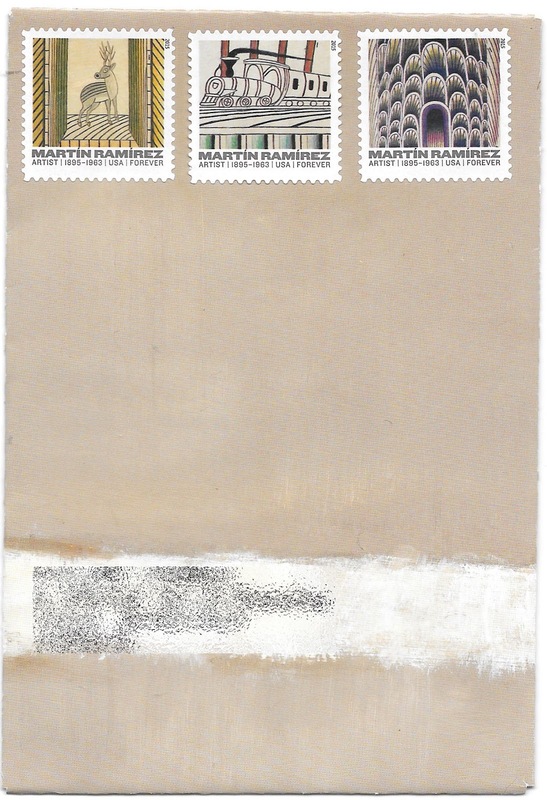 You can see the other stamps here at Posti, the Finnish post office. 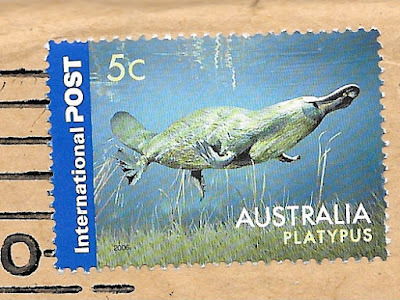 For more stamps from the northern half of the world, visit the links at Sunday Stamps. 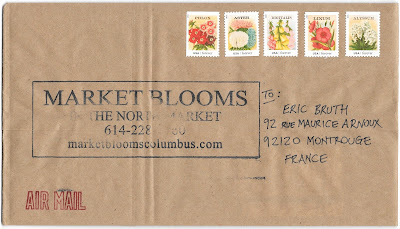 Eric has a mail art call this year to recycle your paper bags and use them in the mail. 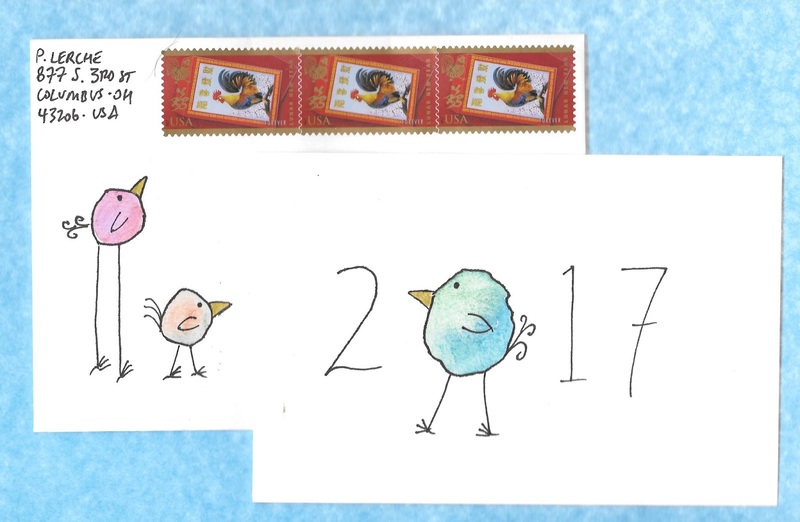 Here's my first sending for this year. 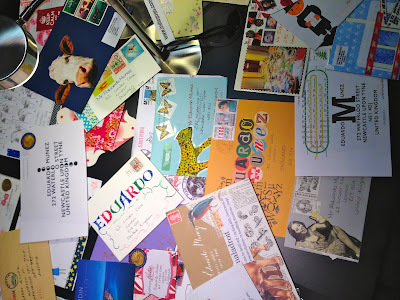 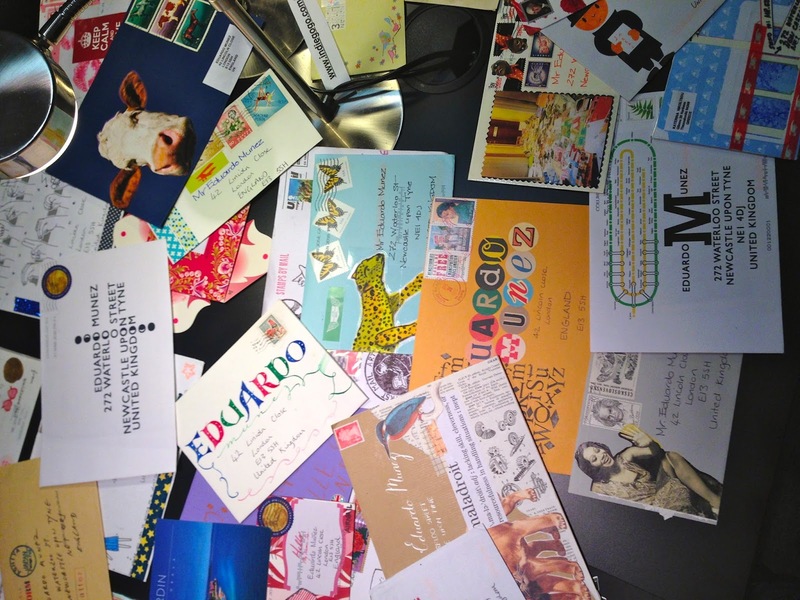 Do you remember the envelopes I sent in that would be featured in a film, 'Who is Eduardo Munez?' ? 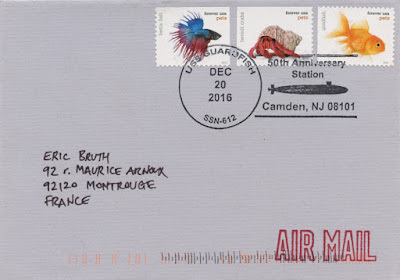 Well, most of the filming is complete, and Ruth Tapp and the EM crew held a ceremony in November where all the letters (500+) were opened! 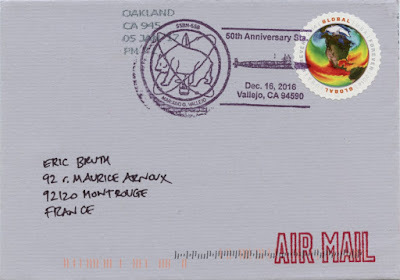 Stripygoose was in attendance, and she kindly took some photos of my mail. In the first one you can see two of mine, plus part of one of Eva's, I think. 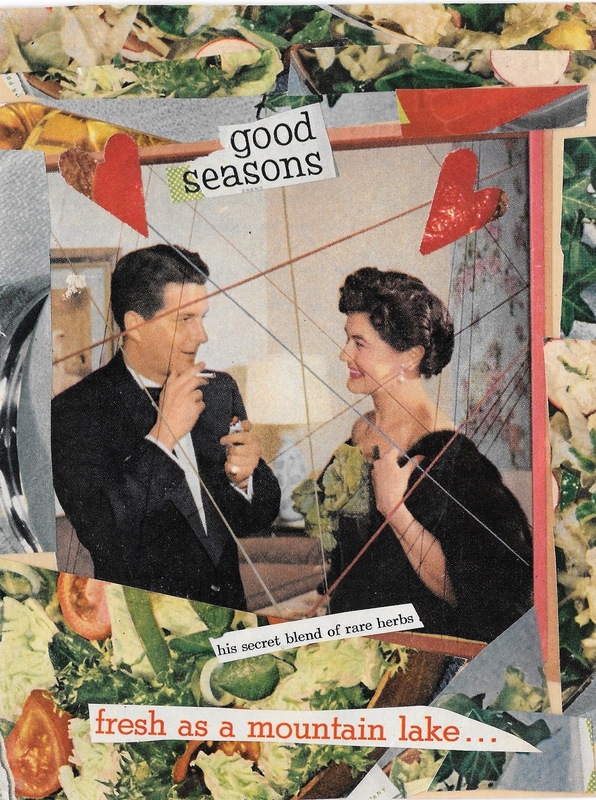 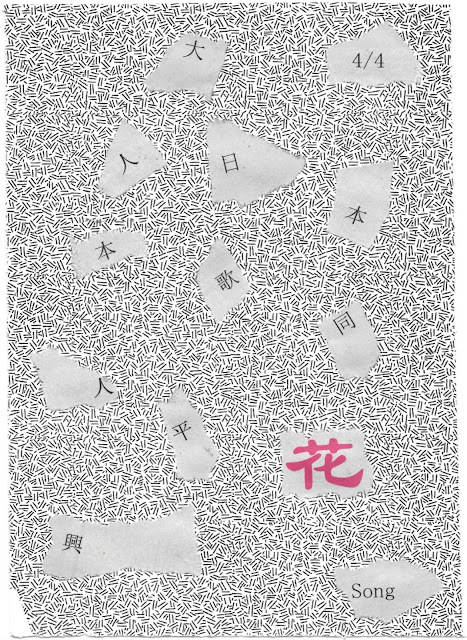 Thanks also to Eva, who first got me interested in this project. This is the third submarine to turn 50 in the same year that Eric turns 50. 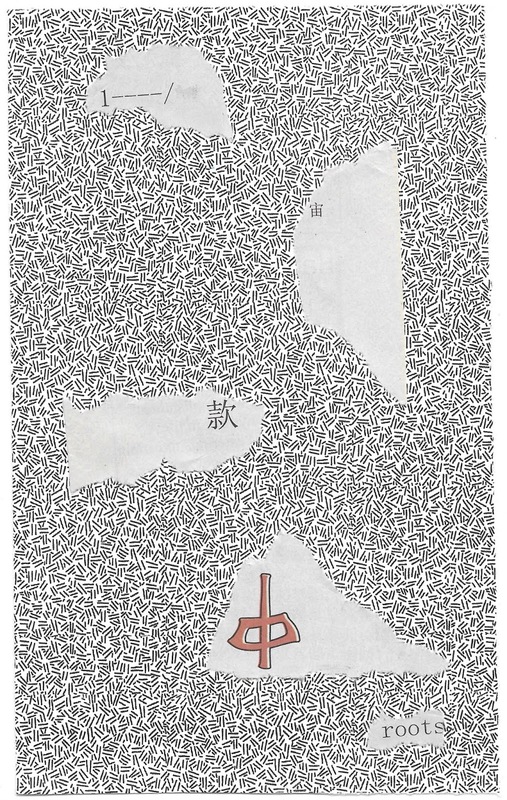 Since the Greenwich meridian runs through London, technically most of Europe is in the eastern hemisphere, however I always associate the east with countries closer to the pacific ocean. 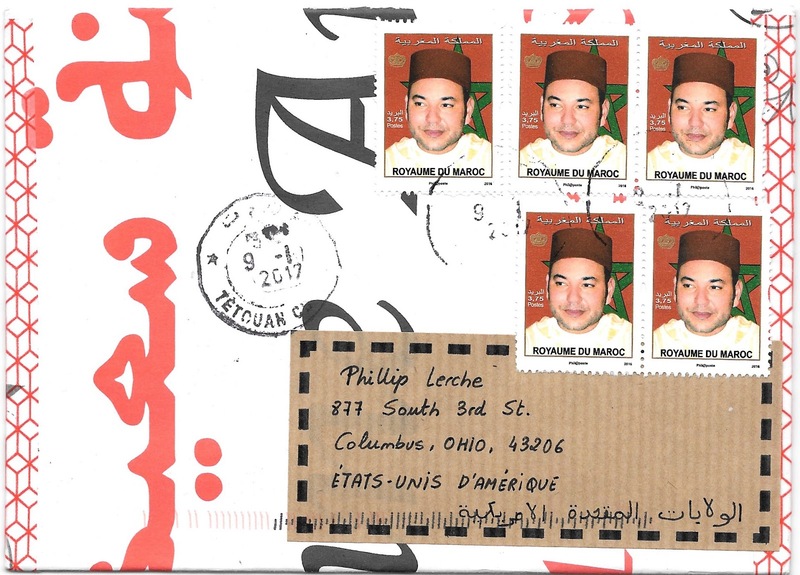 William sent me this fascinating stamped piece of cardboard from the Republic of China, aka Taiwan. 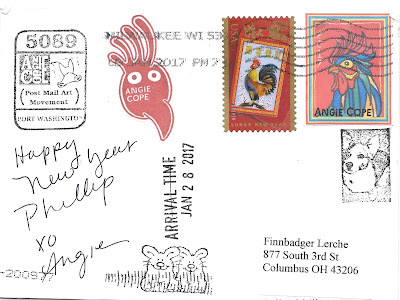 And on the other side was this lovely stamp issued in 2016 featuring the coral Anella mollis. 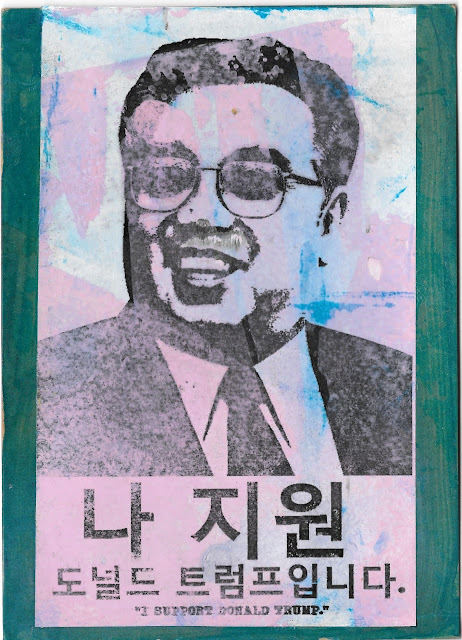 For more stamps from the Eastern hemisphere, check the links at Sunday Stamps. 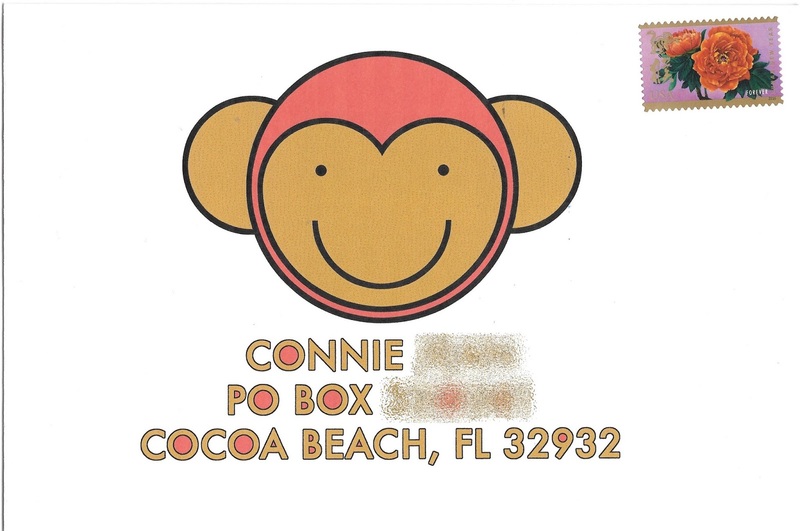 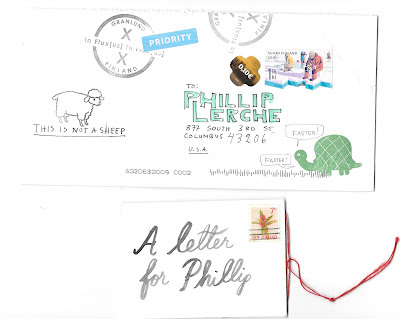 I love how Eva created a palette of colors on these two envelopes that work really well with the stamps. First, one made from a calendar showing the Islamic (1438/1439) and Gregorian (2017) calendars. 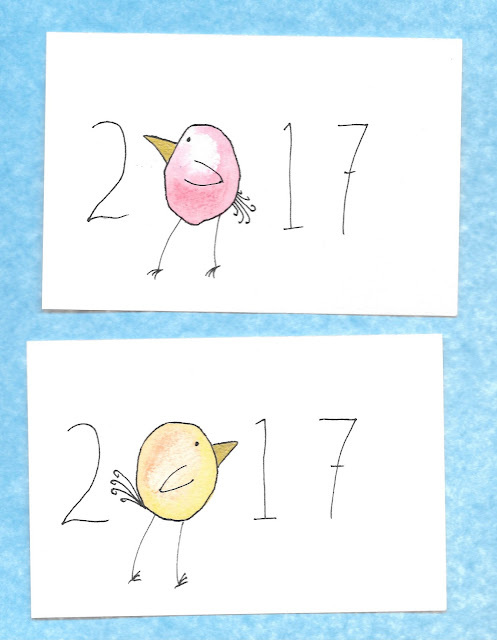 And second, one celebrating writing. 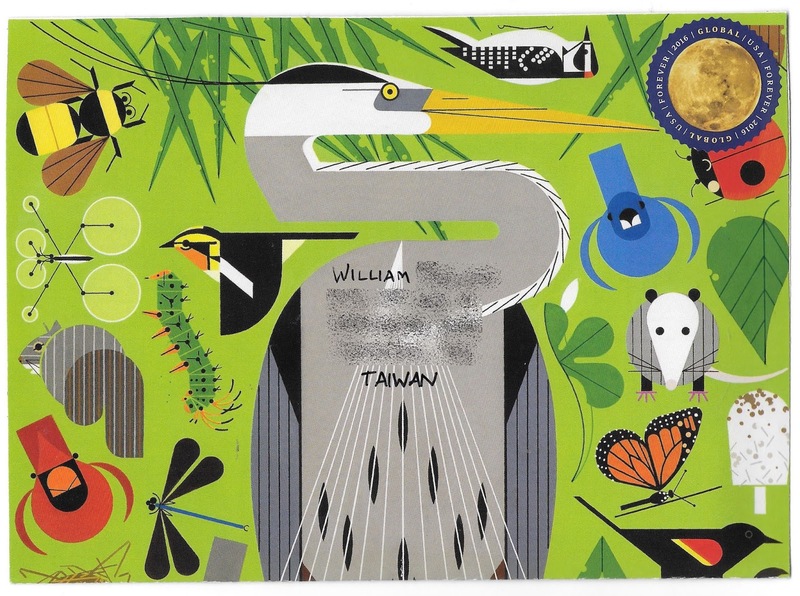 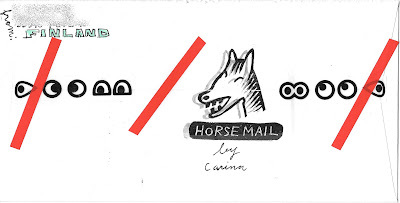 Another great Charley Harper envelope. 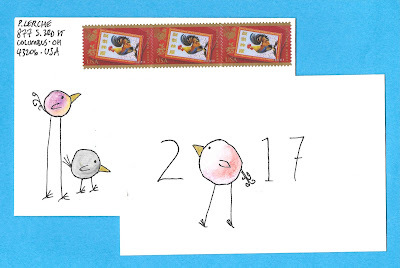 A bunch that I sent out. They should all have reached their destinations by now. I love the bubbles and the chemistry stamp - and even the balloon has a similar shape to the flasks. 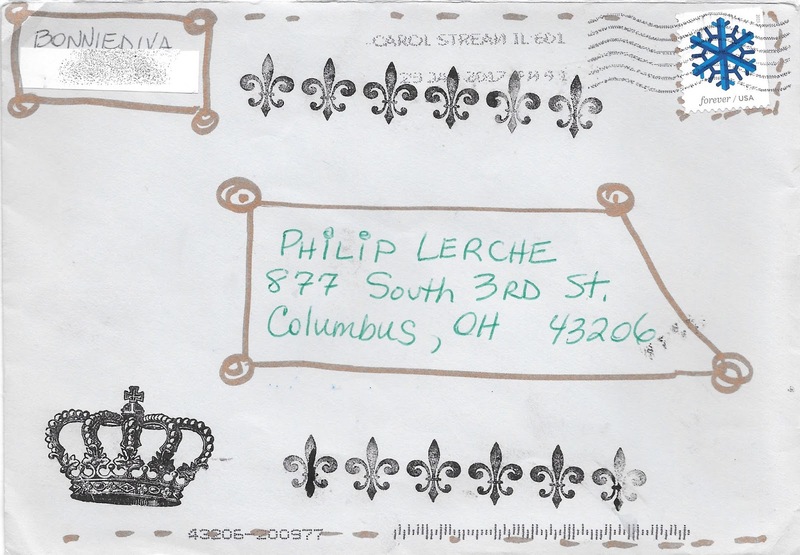 Envelopes 752 and 728 to Lisa P and Michael L.
Another pictorial postmark celebrating a 50th anniversary for Eric. 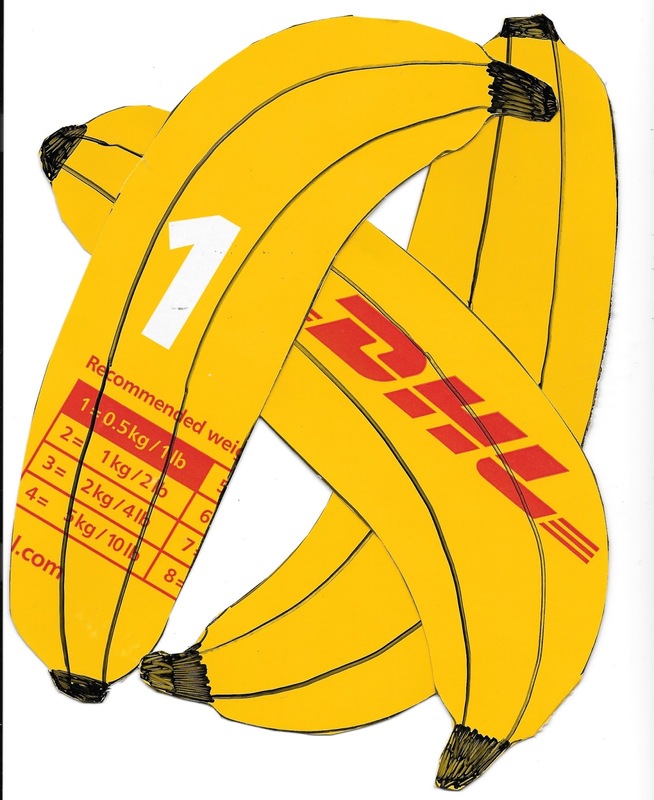 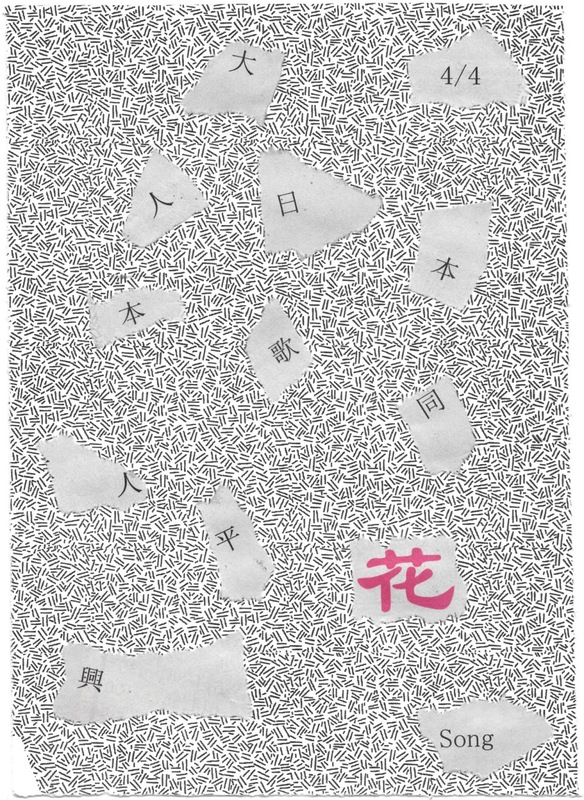 This image is from his blog. 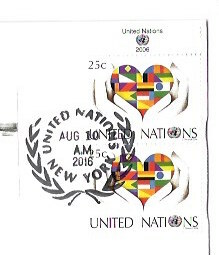 These stamps came on an envelope from the United Nations, which holds territory in New York. 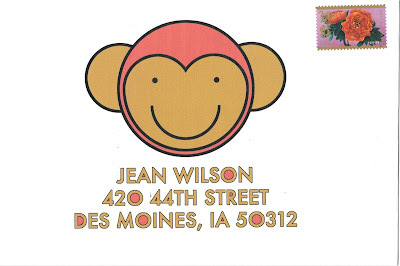 For more stamps from the western hemisphere, check out the links at Sunday Stamps. 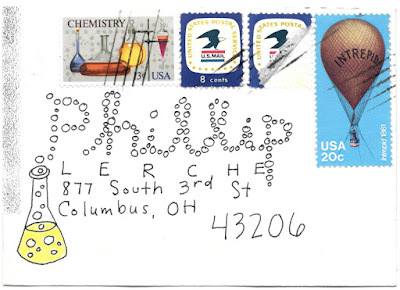 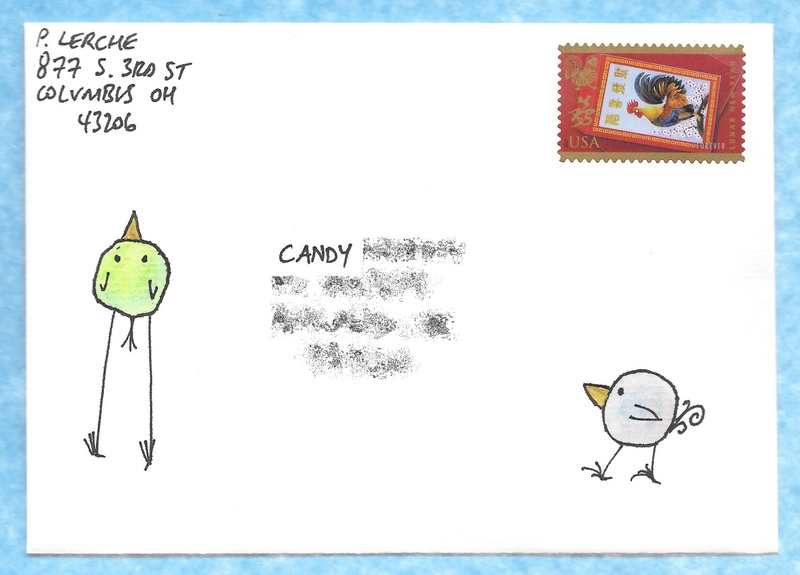 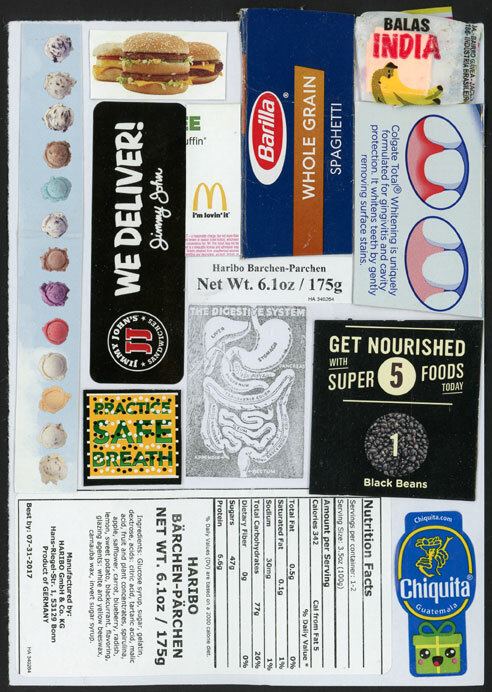 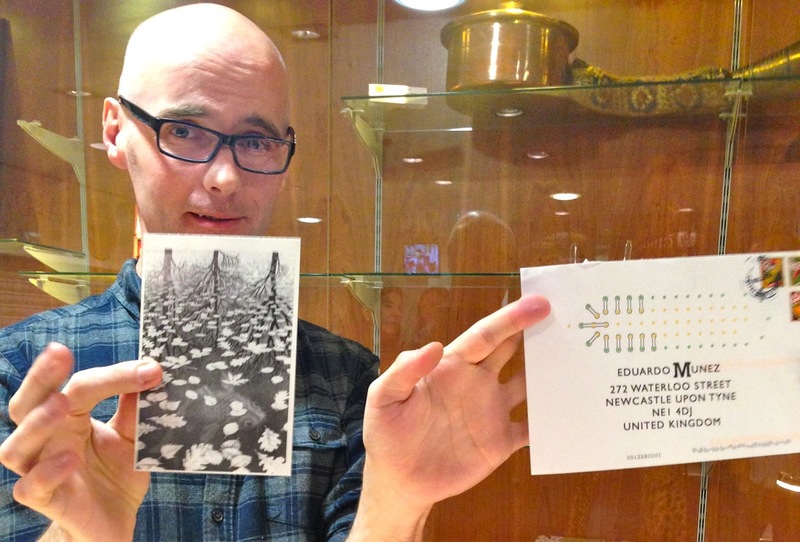 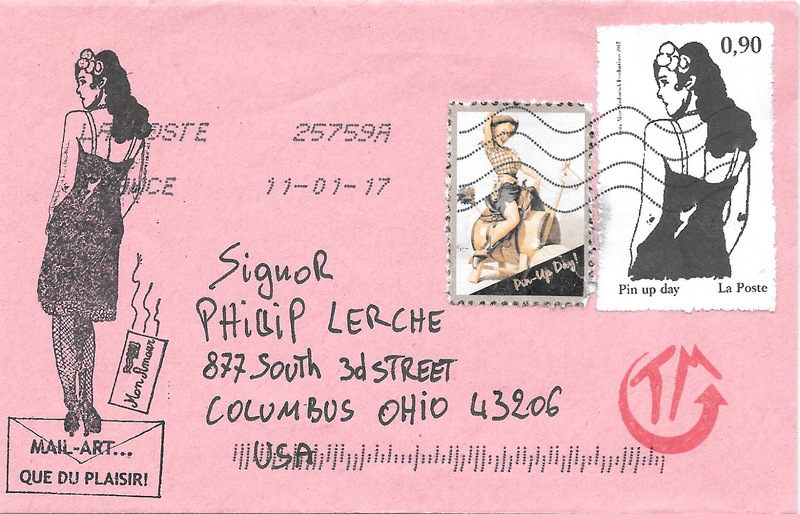 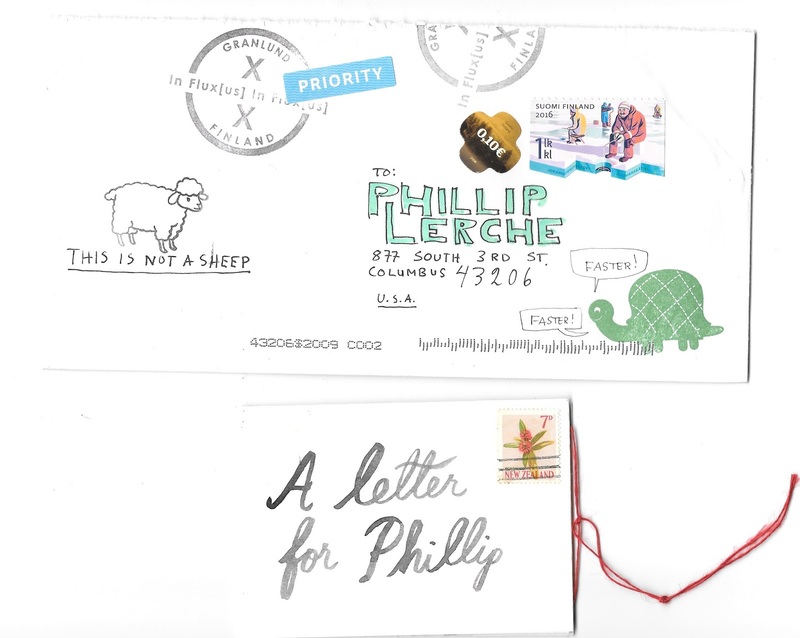 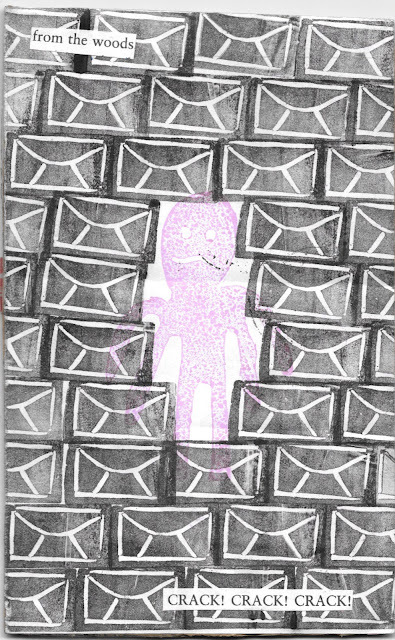 First mail art from a new IUOMA member. 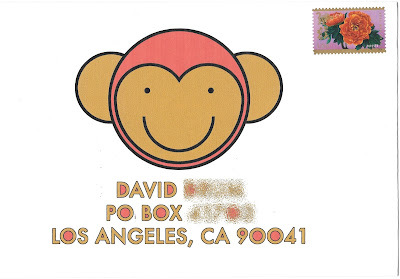 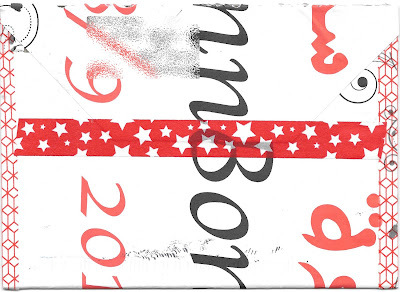 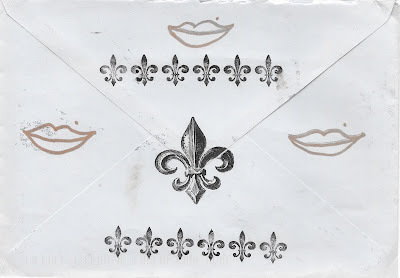 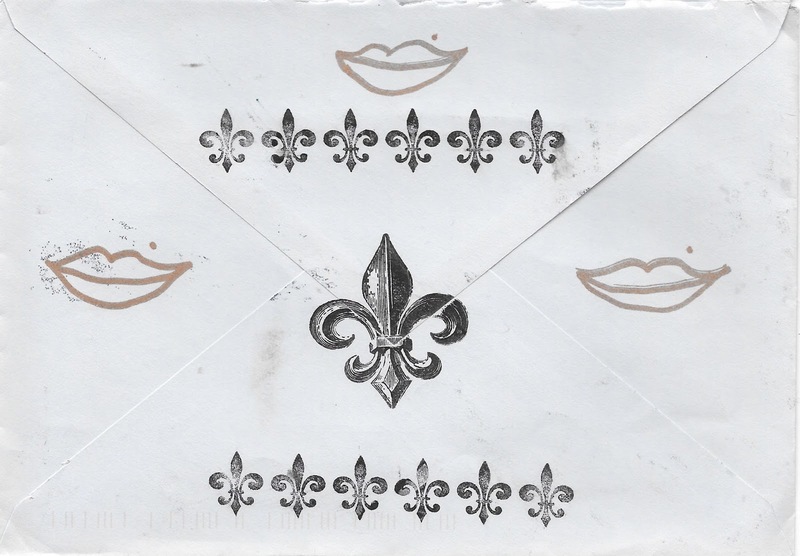 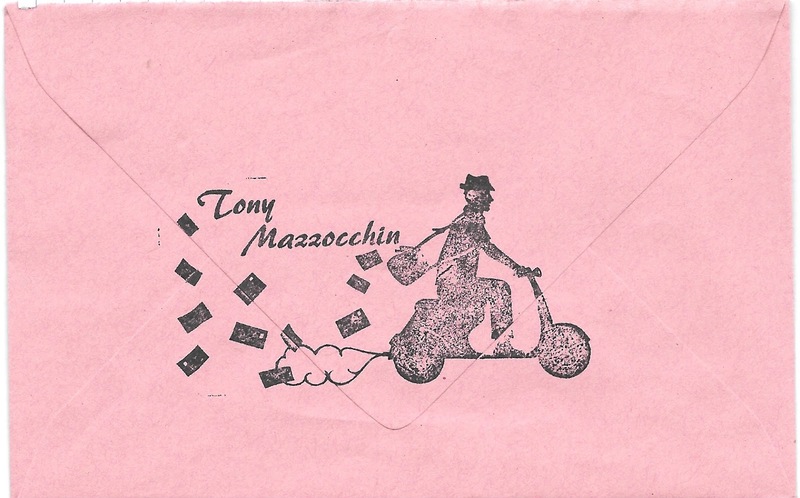 I like the rubber stamping on the envelope. 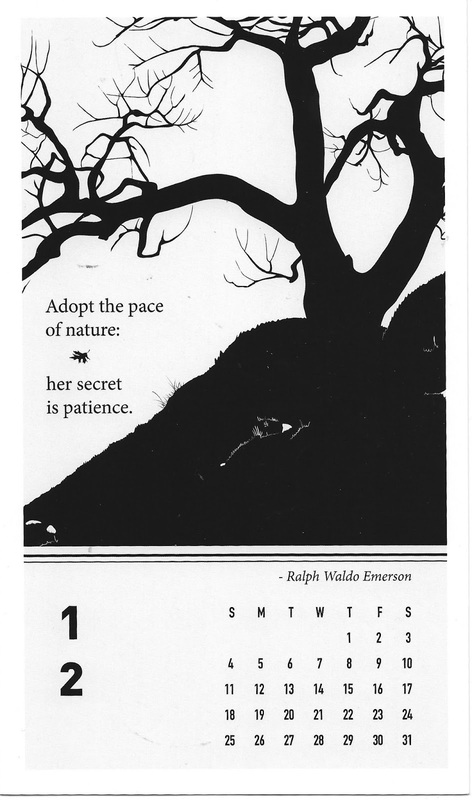 Another calendar page, sent to Kathie. 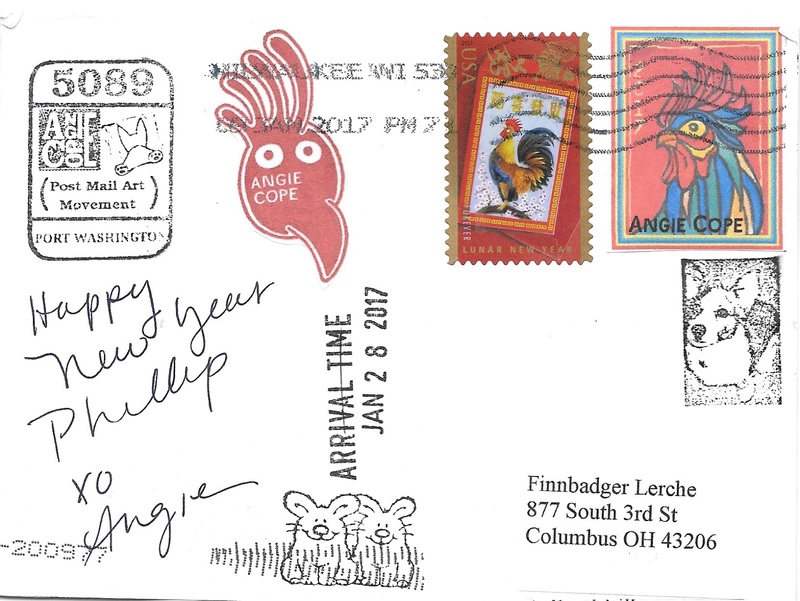 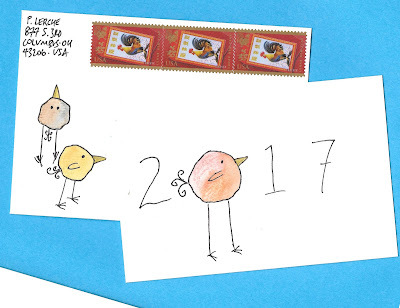 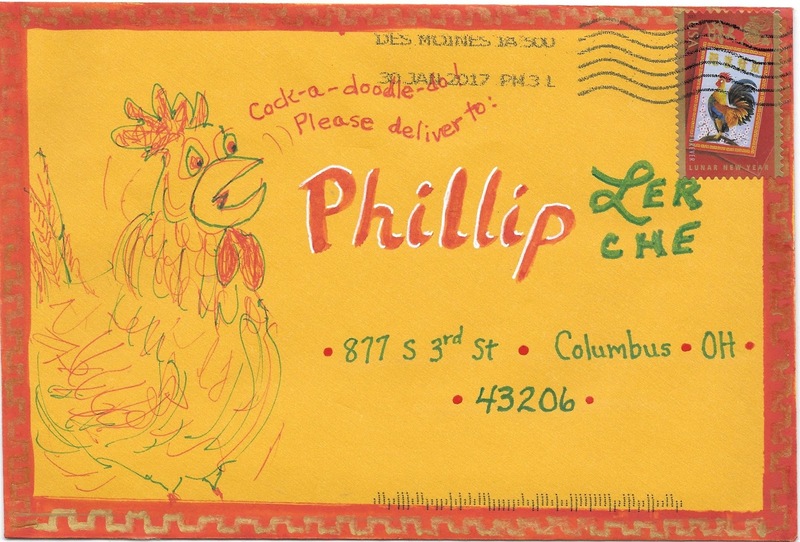 A great year of the rooster themed envelope from Nancy. 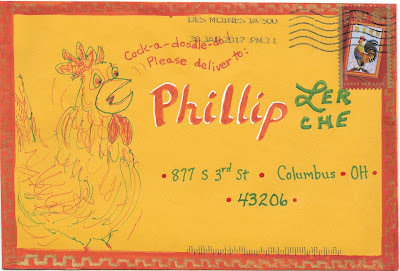 She wrote that her roosters turned out a bit crazy and frantic. 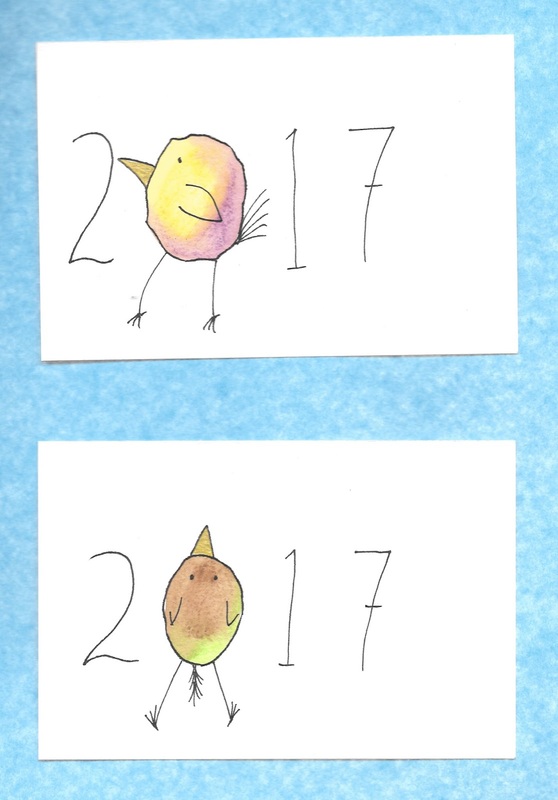 Well, I love mine! It may be a bit hard to see on the scan (the scanner does not enjoy metallic), but Nancy added some gold around the edges - all the colors work so well with the theme and the stamp - thanks! 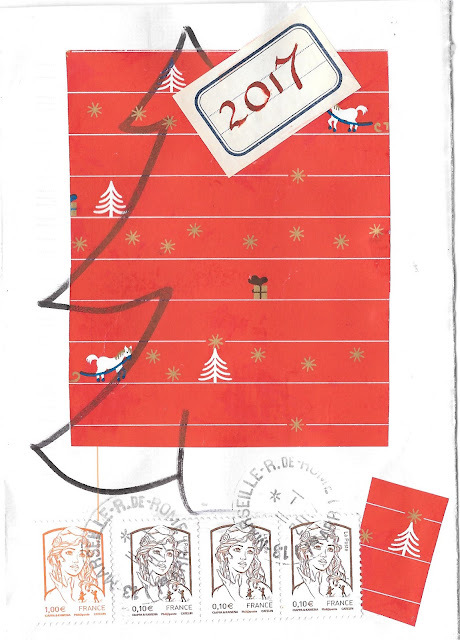 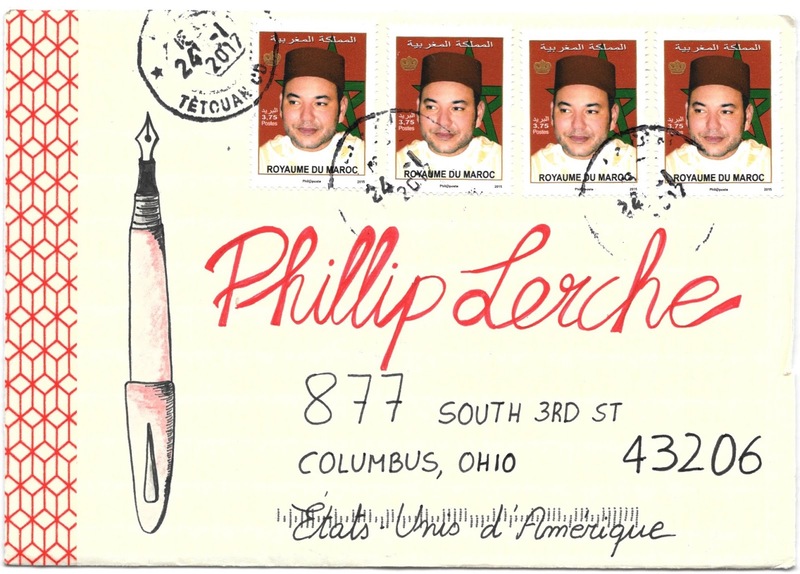 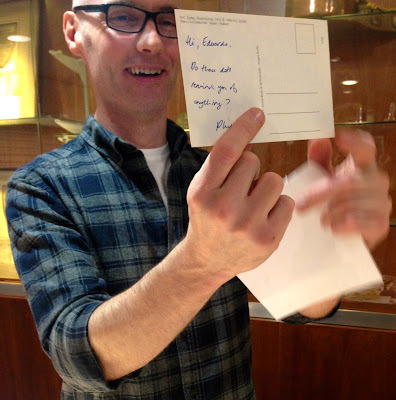 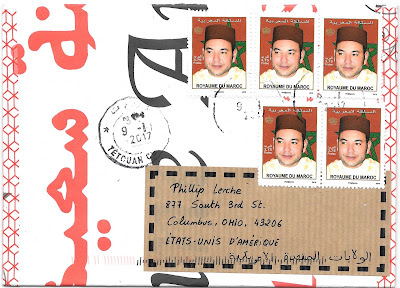 Richard (and La Poste) amaze me - stamps on the back, address on the front. 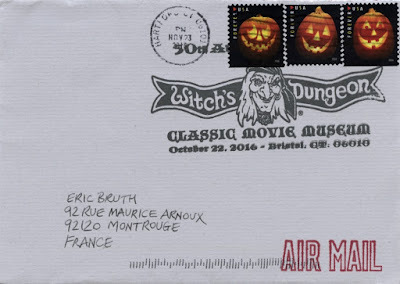 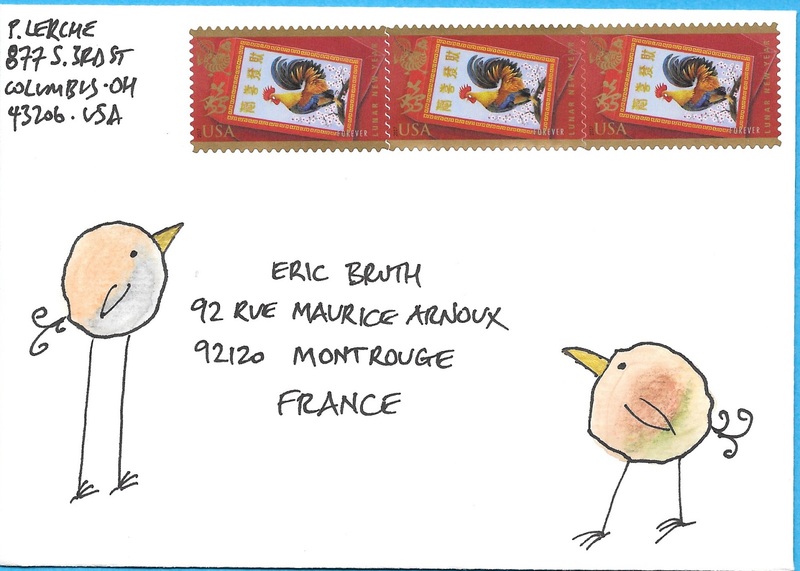 Another 50 pictorial postmark for Eric. 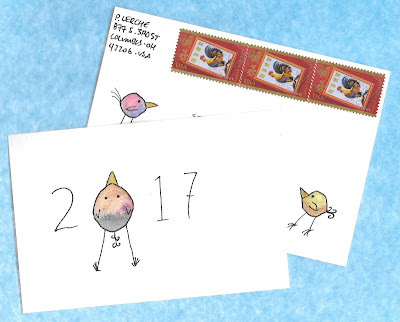 The image is from his blog. Only 267 days until Halloween... you've been warned. 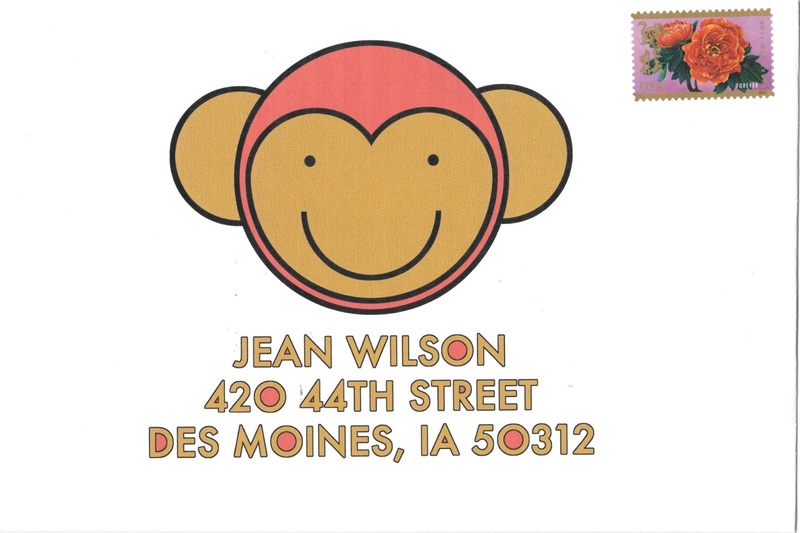 I looked through my (limited) selection of stamps from south of the equator, and was pleased to find this guy! Australia Post has this odd rule about only using stamps that have 'international' on them for overseas mail, so I'm guessing they must have other low denomination ones to make up for new rate changes. For more Sunday Stamps, check the links here. 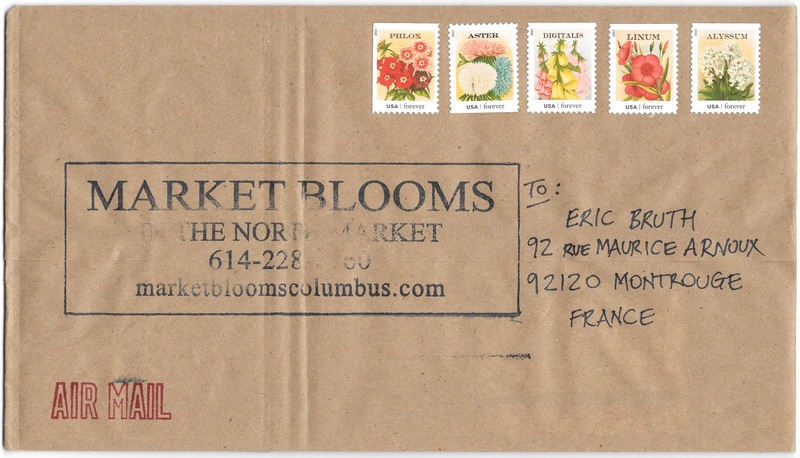 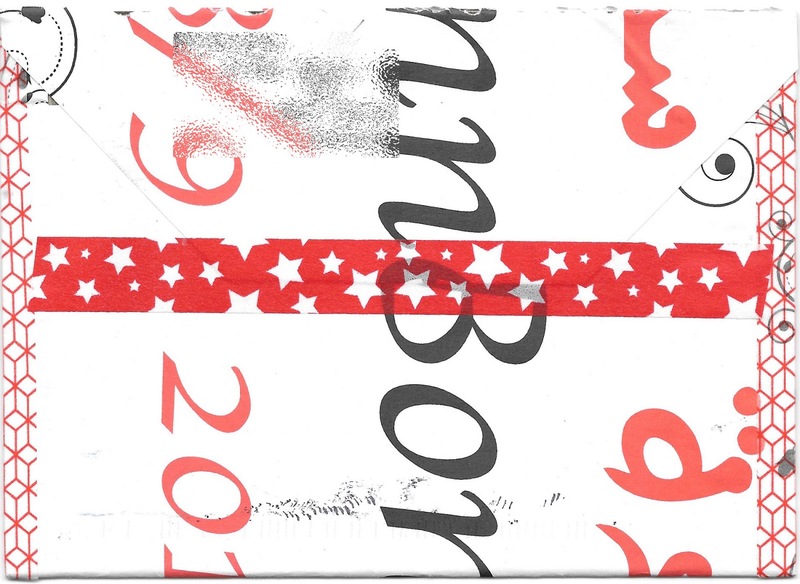 Tony blows my mind as he mails almost everything with artistamps. 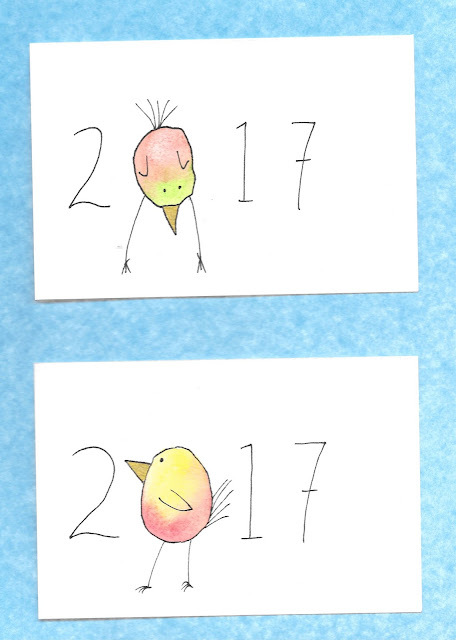 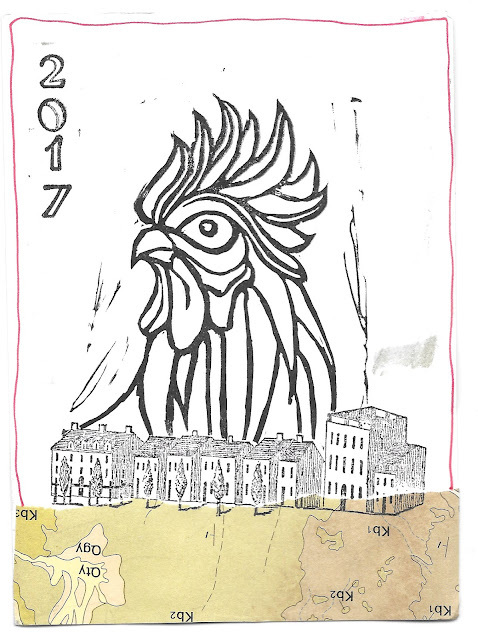 and check out the awesome artistamp alongside the year of the rooster real stamp.